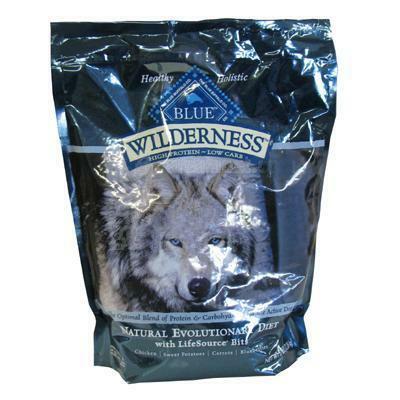 High-protein, low-carb BLUE Wilderness--the perfect food for active dogs. A highly digestible dog food formulated by animal nutritionists, BLUE Wilderness provides your dog with the optimal balance of protein, fats and healthy complex carbohydrates. Deboned chicken, chicken meal, turkey meal, and fish meal supplies the protein your dog needs to support a healthy and active lifestyle. Sweet potatoes, oatmeal and potatoes provide healthy complex carbohydrates for lasting endurance. Blueberries, cranberries and carrots support antioxidant enrichment and make this natural dog food a great choice for your dog. Raw diets are less convenient to prepare than BLUE Wilderness. What's more, with raw diets you typically need to provide additional supplements to ensure what you're feeding your dog is nutritionally complete. LifeSource Bits contain a precise blend of vitamins, minerals and antioxidants selected by holistic veterinarians and animal nutritionists. These include ingredients that have been shown to help strengthen your cat's immune system, support her specific life stage requirements and protect her from the negative impact of environmental toxins. And, unlike other brands that add vitamins, minerals and antioxidants, LifeSource Bits are "cold-formed" to preserve their full potency.